The Philippine Navy’s BRP Ramon Alcaraz. Drills come amidst rising tensions in the South China Sea. The Philippines is set to hold military drills with its ally the United States and its strategic partner Japan next week, Philippine officials confirmed Thursday. The exercises with the United States technically began on June 18, but will be formally opened only on June 22 and run till June 30. They are part of the annual Cooperation Afloat Readiness and Training (CARAT) exercises which Washington carries out with several South and Southeast Asian nations (See: “US Eyes Expanded Military Exercises With ASEAN Navies”). During the exercises, the United States will deploy its littoral combat ship USS Fort Worth, while the Philippines will deploy the BRP Gregorio del Pilar and BRP Ramon Alcaraz. Philippine Fleet public affairs officer Lt. Liezel Vidallon said the exercises would involve helicopter crash and salvage, live fire, deck landing qualification, board and seizure and weapons systems training. 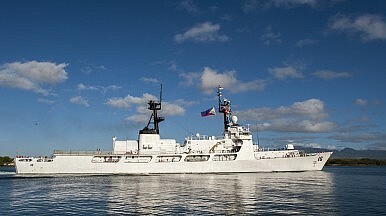 Vidallon also stressed that the holding of CARAT Philippines 2015 near the South China Sea was part of regularly planned and scheduled drills had nothing to do with Manila’s ongoing dispute with China. The exercises with Japan – only the second ever between Tokyo and Manila – will be staged separately but during the same week as the U.S. drills (See: “Japan, Philippines Hold First South China Sea Naval Exercises”). As I reported earlier this month, Philippine Navy spokesman Colonel Edgard Arevalo had confirmed that the exercises will be part of a series of activities lined up for a country visit by the Japan’s Maritime Self-Defense Force (JMSDF) from June 22 to June 26 (See: “Japan, Philippines to Hold New South China Sea Naval Exercise”). Specifics of the exercises, however, still remain unclear. The Philippine Star noted that Philippine Navy spokesman Commander Lued Lincuna could not immediately provide any further details such as where the exercise would be held. But Japanese public broadcaster NHK had previously reported that the exercises will be held near the South China Sea and that the MSDF would dispatch a P-3C maritime surveillance aircraft to the drill. Additionally, as I reported previously, Arevalo had earlier revealed that the exercises between Manila and Tokyo would include humanitarian assistance and disaster response, maritime search and rescue, and maritime situational awareness training and cooperation. There would also be staff-to-staff talks conducted during the visit to strengthen information-sharing and step up maritime situational awareness. Lincuna, for his part, did say that the drills would help familiarize Philippine troops with modern equipment through the sharing of information, techniques and best practices on a technical level. The drills between Manila and Tokyo come shortly after Philippine President Benigno Aquino III’s visit to Japan during the first week of June. During the visit, Aquino and Japanese Prime Minister Shinzo Abe both pledged to strengthen the security side of their strategic partnership through a range of measures and agreed to open discussions on a visiting forces agreement that would allow Tokyo access to Philippine military bases (See: “Japan, Philippines Seeking New Pact on Military Bases”).